There are some events which happen once in a lifetime. They leave their mark for ever. This week saw one such event in the world of finance - the stunning collapse of Lehmann Brothers and Meryll Lynch and AIG teethering and can drown anytime unless Fed steps in. 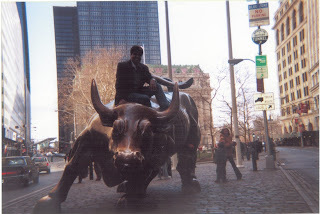 Wall St, never had it so bad and raging bull in front of it, watching it helplessly. The decline started with collapse and fire sale of Bear Stearns. The tsunami of sub-prime has swept away everyone on its way. The top five investment banks have been reduced to two and who knows how long will even they survive. Goldman Sachs, which looked stronger till recently, suddenly looks vulnerable. Rumours are that even Morgan Stanley is not safe and may merge with GS. These firms were mecca of high finance and every MBA worth his salt dreamt to work there. The collapse has sent the world markets into tizzy. Every country has been affected. Markets opened with trepidation and fear. Central banks of all nations are having sleepless nights and are working in a co-ordinated fashion to prevent the contagion and save the world from plunging into a major financial crisis. That its happening in front of eyes is unbelievable. Thousands of jobs are at stake. Banks who have exposures on these entities, firms who have taken big punts based on commitments from these firms...all are at risk. Catastrophy of this magnitude and the speed of collapse is spectacular or should I spectacularly shocking. Markets are squeezed dry. No one wants to lend...money market has evaporated..no one believes the other, trust gone..faith gone...back to treasury bonds. Isn't this scary. No liquidity has further aggravated the problem and will acclerate the (in)solvency. What next - how bad can it go, has it bottomed out ? Is it at 50%, or worst - is it still tip of iceberg ? AIG has just been bailed out by Fed, by pumping in $85BN ( 50% of India's budget ) for 80% stake. America, the land of capitalism is in tatters, pride gone, standing with head down in shame, reputation tarnished, probably paying for reckless greed, primarily driven by few names. Makes me feel sad. I love that country. It shouldn't have happened. It probably could have been managed better. How come land of intellectuals and nobel laurettes let it happen. What went wrong ? In some way, was it greed, that was responsible. Appears everything was overlooked or justified in the name of big money.... companies showing bulgy bottomlines and executives fatter paychecks. Wasn't it common sense...then why was it allowed to go unchecked, unabated...to allow the entire economy to be put at risk...their own taxpayers money to be used to bail out greedy investors and shareholders. If it is sub-prime, it had to go wrong...some day...trees don't grow up to the skies. In the name of financial innovation..basics were overlooked...derivatives, covenant lites ( I find this funny as well ) were the tools used to wreak this havoc and were rightly called weapons of mass destruction (WMD). Well rumour mill is on...it is being said that that some more US banks are in line - Wells Fargo, Washington Mutual,Countrywide gone, Alt-A, credit card, European banks -UBS etc, currency derivatives, yen carry trade. Sheer thought leaves me in shudders. Well I hope there are lessons learnt and we avoid repeating same mistakes. Let the bull rage again, let wealth be created. Let the fear go, let the smiles be back on faces of employees, families and investors. Long live the free market.